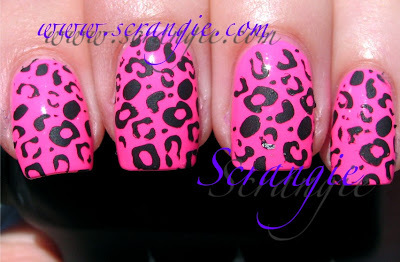 Scrangie: Matte on Glossy Konad and Reminder about OC Nail Art's Konad Contest! Matte on Glossy Konad and Reminder about OC Nail Art's Konad Contest! When I was swatching some of the new neons from Zoya and Essie a few weeks ago, I decided to do a little Konad experiment. Before I removed my polish, I slapped on a quick Konad design using KO Black. KO Black, in case you're not familiar with it, is a matte black polish, perhaps even the mattest black there is. While I am not crazy about my color choice, I do love how it turned out. Does anyone remember those velvet color by numbers type posters? All of the outlines of the image are done in black velvet, and you have to color in the spaces in between to make the picture? I have a Sailor Moon one somewhere that I made years ago. This looks exactly like that. The outline is done in black velvet. The only downside to it is that it didn't last very long. Since I had applied a coat of Seche Vite to make the neon glossy, the KO Black had nothing to stick to and started chipping off within minutes. You can even see in the picture where parts of it had fallen off. When I took a shower later that day, almost all of the KO Black washed off! Weird. Sealing it with a top coat would defeat the purpose of the matte on glossy look. I'll probably give this another try soon, maybe I'll use basecoat as topcoat to see if it helps the matte design stay on. And speaking of Konad, don't forget about OC Nail Art's Konad Contest! It ends TOMORROW! Here's my original post with all the rules, but I'll summarize. Create a design using any of the items in the B Kit (also known as the Luxury Kit) which contains: m4, m8, m15, and m21 plates and red, white and green special polish. Submit your pictures or videos to Kathleen (contest@ocnailart.com), along with the name of the blog that referred you and permission for Kathleen to use your images. The winner AND the blogger who referred them will receive the humongous Professional Salon Case, the one that costs $437 and contains just about every Konad product ever. Please visit the original post for full rules and details. Again, it ends Sunday, May 31st at midnight, so get your entries in!! I REALLY like the colors. Pink & black always look great together. It looks amazing. I love it! That's very nice. I like the different textures/finishes, whatever you want to call it! ooh nice. I know exactly what those velvet coloring sheets you're talking about. It also kind of reminds me of those crayon things where you put a bunch of rainbow colors down on the paper, then layer black over it, then scrape off the black to get cool rainbow pattern/pictures. You should do a mani like that!! Do a rainbow colored thing on the base (like yellow, pink, orange, and violet) and then do black patterns over the top!! Oh wow - those look really nice! You've got such a talent for colors and patterns and your nails are so beautiful. Jenn - I love your idea! The other day I thought it would be cool to paint my nails black, then do the flame-looking french tip from Konad in yellow and red (paint both and scrape across the mix the colors), but I haven't had the time to do it. Sounds good in theory, though - maybe similar to your idea. Scrangie Girl? What do you think???? I love both of the Konadicures. I love the combination of pink and black. I also love the combination of matte and glossy. So so pretty. *JENN*, Yes!! Those are also super cool and that's an excellent idea!! Kathleen, thank you so much! And that sounds like a super cool idea. I haven't quite mastered the two-color trick but everytime I see someone do it I go crazy for it! MoLo, the brush idea would definitely work! 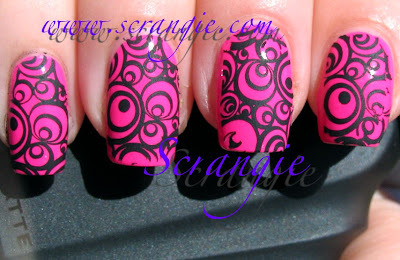 The nails with the circles are amazing. Is the Konad design thing hard to use? Igoogled it and looked around but I couldn't find the plate with the design you used, which one is it? Del Sol Sale and some answers. More from BB Couture For Nails! Another special deal from Nubar! 20% off of $50 or more at Nubar!